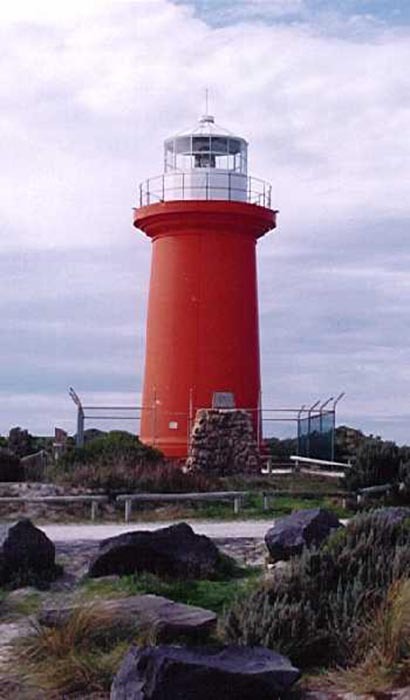 Cape Banks Lighthouse | Lighthouses of Australia Inc. The lighthouse was established in 1883. The original structure was 7.5 metres in height and was made from local limestone. The lantern was used from the old MacDonnell Lighthouse (demolished in 1882) at Cape Northumberland. The original character was alternating revolving, showing one red and two white faces. The illuminant was vaporized kerosene with an incandescent mantle. 3 groups (3 lamps in each group) 2 white and 1 red. In May 1928, it was raised to 15 metres. With this upgrade upgrade the light was demanned and the keeper’s cottages have since been demolished. Until 1976 the light was run on a Dalen Acetylene Gas system which mixed the gas with air and also rotated a lens. It was then converted to electric in using the lens from St Francis Island. The lighthouse reserve is accessible to the public. The road is a sealed bitumen to Carpenter Rocks, then unsealed for the last several kilometres to the lighthouse. There are no tours.